Book a New Plymouth car rental with VroomVroomVroom and explore the North Island. We compare car hire deals from top suppliers including Budget. A car rental in New Plymouth is the best way to explore the region. New Plymouth is a vibrant city on the west coast of the North Island. The Taranaki region featured in Lonely Planets 'Best in Travel' publication. Taranaki is one of the hottest visitor regions in the world. Temperatures can get chilly when the colder winds blow in from the Tasman Sea. Wide selection of cars. The earlier you book, the more choices you get on rental cars thus making it easier to find the perfect vehicle for your next trip. Great rates. Get the best deal when you book with us. Read our Price Promise for more details. Excellent customer assistance. Our friendly customer care experts are ready to answer your questions. Feel free to contact us via phone, email or live chat. We have been helping people book a rental car since 2001. When in New Plymouth, you will experience an oceanic climate. It is often sunny and temperate. February is the driest month, while the coolest month is August. On average, the months January, February and March have nice weather. If you don't like too much rain, avoid visiting New Plymouth in July as this is the wettest month. Most rainfall occurs from March to December. Are you planning a road trip from Auckland to New Plymouth? The approximate travel time is 4 hours and 34 minutes (361 km) via State Highway 3 and State Highway 1. With a reliable car rental, it is easy to explore the beautiful North Island. Driving to New Plymouth will take you through some unique spots. These include the beautiful baiting village of Mokau. In New Plymouth, you are always aware of the brooding Mt Taranaki. It is often shrouded in cloud. Dominated by the mystical Mt Taranaki, New Plymouth is a vibrant city which is part of the 10th biggest district in New Zealand. Hiring a car with VroomVroomVroom is the ideal way to explore this territory. Ever wanted to go surfing and snowboarding in the same day without a big drive in between? Well, having a car rental in New Plymouth makes that very dream possible. Use our travel guide to help you get the best out of this city. When Lonely Planet named Taranaki as the second best region in the world to visit in 2017, they singled out this public gallery in New Plymouth as one of the compelling reasons to go there. The Govett-Brewster Art Gallery is a contemporary art museum of the Pacific Rim. 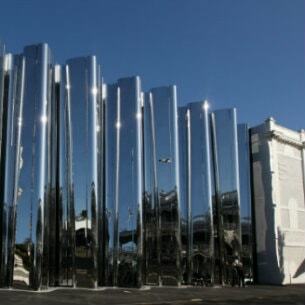 In July 2015, it opened the Len Lye Centre as an addition to the gallery. Len Lye was a pioneer of experimental film and kinetic sculpture, and considered one of the most original artists of the 20th century. Visitors can enjoy both venues in a shared and flexible structure. The art museum houses a state-of-the-art cinema, exhibitions changing three times a year, workshops, tours, talks, venue hire, family and kids' art-making and a shop for something a little bit different. Admission to the combined centre and gallery is free. They are open 6 days a week, and closed on Tuesdays. This landmark looms large over the city. Geographically, it's stunning, a nearly perfectly symmetrical cone shaped summit. It has been a feature in movies such as 'The Last Samurai,' when it stood in for Mt. Fuji! Experienced skiers can get on the Manganui ski field, through the Stratford Mountain Club. There is a challenging walk to the summit for skilled climbers. On the lower slopes many walks are accessible through through the Egmont National Park. Get the kids enthused on 'The Enchanted Track', a 2-3 hour walk through the Goblin Forest, so named for the gnarled and twisted tree trunks along the way. This natural wonderland is filled with native trees, local fauna and flora on display offering a place where you can relax and enjoy yourself. With plenty of street parking available, you can leave the rental car with peace of mind and get out to explore the 52 hectares of bush reserve and gardens that fill the heart of New Plymouth. The park adjoins the Bowl of Brooklands, a performance venue, and the Brookland's Zoo. The park is the setting for two of New Plymouth's most popular events, the TSB Festival of Lights, held each December and January, and the Womad Festival, in March. This is an award winning 12.7 km path from the sea edge of Pioneer Park at the Port of Taranaki that goes all the way to Bell Block Beach. Along the way you can cross the stunning Te Rewa Rewa bridge, and admire the Wind Wand by artist Len Lye. Located across the road from the city centre and half a block from the coach terminal, Ariki Backpackers makes for a perfect location to base your stay while you explore New Plymouth's city attractions. This place is ideal if you're traveling on a budget as they do not only provide a spotless environment and top customer service accommodation, but their prices are also very affordable, so you can enjoy more of New Zealand. When individuals of native descent to this cuisine rave of its authenticity, it's not surprising that it's ranked #1 of the 103 restaurants in New Plymouth. Kathakali Restaurant is the receiver of Tripadvisor's "Certificate of Excellence" award in 2014. If you're looking for an international food experience, Kathakali is definitely the way to go. Not one for international spice and Asian flavours? How about New Plymouth's award winning fine dining restaurant? With a luxurious, airy, modern and spacious atmosphere and food of the highest quality, flavour and technique, you certainly won't be disappointed. Avis New Plymouth Downtown - 77-79 Gill Street, New Plymouth, NI. Budget New Plymouth - 77-79 Gill St, Cnr Gill St & Gover St, New Plymouth, NI.